Two men have been killed in a light aircraft crash in mountains in Spain. Pilots Simon Moores, from Westgate on Sea, and David Hockings, of Herstmonceux, were flying from Portugal to Kent on Wednesday. The Piper single-engine aircraft, owned by Mr Hockings, had been due to make a stopover in northern Spain. Spanish rescuers said two bodies were recovered from Hernio mountain in the Basque region. Mr Moores - the brother of Bake Off judge Paul Hollywood's estranged wife, Alex - was one of the few aerial banner pilots in the UK. 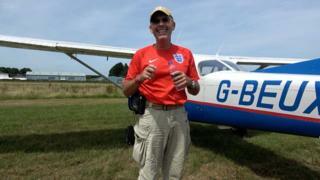 The 62-year-old former Thanet District Council Conservative councillor tweeted pictures from the air Wednesday. Mr Hockings, 67, ran an aircraft maintenance company called Cristal Air based at Spilsted Farm airfield at Sedlescombe, near Hastings. The Aviation Safety Network said the plane crashed at 13:50 GMT on Hernio mountain in northern Spain's Basque Country. Mr Moores worked as an aerial photographer and recently had been attempting to film migrant boats in the English Channel.